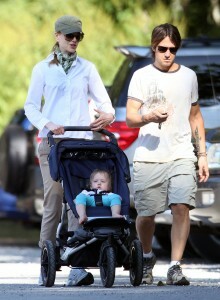 Nicole Kidman and Keith Urban were seen over the weekend enjoying a beautiful day at the park with daughter, Sunday. The pair seemed to thoroughly enjoy the sunny day relaxing with their daughter, who is growing by leaps and bounds and quickly acquiring her parents superstar looks! Sunday rides in a Mountain Buggy Urban Stroller.